One of the things I looked forward to most about coming to China was the food. I was prepared for the worst, but was pleasantly surprised. People had warned of an unrecognizable cuisine, not at all reminiscent of its American counterpart. For the most part, this wasn't the case. Back in the US, I was lucky to live in a city with a formidable Chinatown that contained a few excellent dim sum places and plenty of authentic eating options. I was also lucky enough to frequent these places enough to have tried many things that I'd later discover while living in Beijing. That isn't to say that I haven't encountered (and eaten) many things that I never thought I'd see. There will be many posts about those adventures here, but right now I'm going to stick to my favorite thing about Chinese food: the street variety. Seriously. Walking down the street is like dim sum. Every day is like dim sum at Joy Tsin Lau or Golden Ocean (or Palace or whatever its called). Since my Mandarin is limited to: "I America person", "We go to this place", "that one" *points*, "thank you" and "airplane", my experience with street food has actually been VERY similar to my experience at dim sum! For those of you that have been to an authentic dim sum in the US, most often employees wheel around carts with different small dishes on it. More often than not, these people have very limited English and non-Chinese patrons are reduced to pointing and hoping. The same is the case here, except I am the one who doesn't speak the local language. It hasn't really been a problem yet, but I've definitely eaten some new things as a result. I'll start with some of the more normal stuff and graduate up to the weirder and sometimes more enjoyable. As you quickly learn, there is clearly some overlap between those groupings and I'll do my best to elaborate. I'll start with something you've seen before. You've seen the final product, but at left you can see it being created. This delicacy starts out like any other crepe: circle out the batter, crack an egg on, mix it up a little. Then it starts to get awesome. Add scallions and some crunchy greens. Slather with slightly sweet gravy and slightly hot chili sauce. Then it gets really cool. Add a long thing crunchy fried rice paper sheet. Fold crepe edges over crunchy sheet. Crack in a few places to fold the whole crepe up into a 6' by 6' perfect breakfast. Seriously. Every place in the world should offer this treat. This basic forms of this item don't take much explaining. 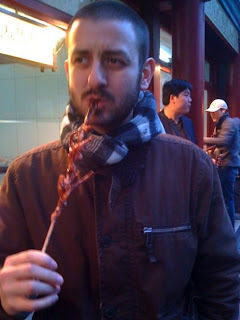 Meats or Veggies stuck on skewers and flame grilled or boiled in sauce. Below you can see a wide variety simmering. The stick is a greatly overlooked vehicle for food delivery. In the US, its relegated to middle eastern restaurants, backyard grilling and, of course, corn dogs. In China, its used to elegantly and gracefully display the most bizarre foods you'll ever see. Below, observe a novelty kabob stand in a touristy market street. This stand is for chinese and international tourist - don't think that this type of fare is regular for anyone. Not all crazy street food is really that crazy. 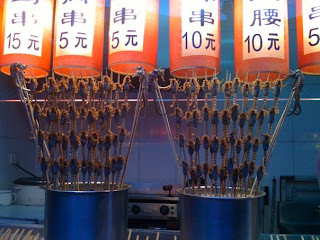 I tried a bunch of what I thought were squid tentacles on a stick. If I were a betting man, I'm put money on them being squid tentacles. But since I'm not a betting man, I'll just say I THINK they were squid tentacles. Stay tuned for Street Food (#2).